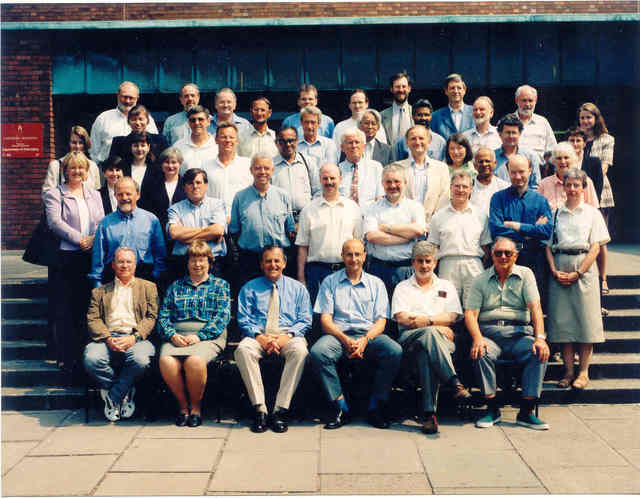 Commission members and Chester Editorial staff at the Manchester Meeting of the Commission on Journals, August 1999. Front row, left to right: A. M. Glazer, J. P. Glusker, S. R. Hall, J. R. Helliwell, F. H. Allen, A. Authier. 2nd row: J. Vicat, A. L. Spek, G. Ferguson, A. Linden, A. J. Blake, W. Clegg, Peter Strickland, C. P. Brock. 3rd row: Andrea Sharpe, Louise Clark-Jones, Sue King, G. R. Desiraju, M. M. Harding. 4th row: Nicola Ashcroft, Katie Moore, C. Lecomte, M. Vijayan, A. Kalman, M. Moore, M. J. Adams, G. B. Jameson, Jill Bradshaw. 5th row: Gillian Holmes, F. R. Fronczek, D. Schwarzenbach, A. Oskarsson, Y. Ohashi, D. Pandey, I. D. Brown, Amanda Berry. 6th row: H. M. Einspahr, W. C. Stallings, M. R. Taylor, Mike Hoyland, Sean Conway, Brian McMahon, G. Kostorz, C. J. Howard.